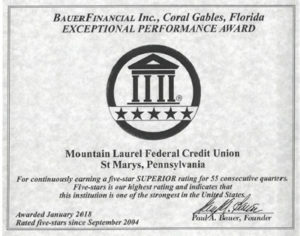 Mountain Laurel FCU is rated a 5 Star Credit Union by Bauer Financial. 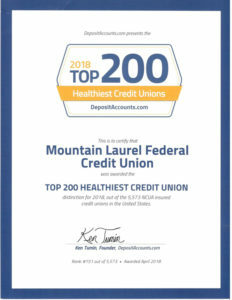 According to Bauer Financial, Mountain Laurel FCU exhibits a superior financial condition, characterized by very strong capitalization, a very high measure of asset quality, net profitability and seemingly ample liquidity. Mountain Laurel Federal Credit Union is a not-for-profit financial institution owned by its members. It is our goal to provide our members with a full range of financial services at competitive rates, while maintaining financial stability. In offering these services, we will promote thrift and growth while continuing our philosophy of “Member Helping Member” in an ever changing world. Membership is also extended to immediate family members of all current members of Mountain Laurel FCU. If you have additional questions about membership, please call us at 814-834-9518. Before applying for membership, please familiarize yourself with the requirements of the USA Patriot Act. Important Information about procedures for opening a new account: Federal law requires all financial institutions to obtain, verify, and record all information that identifies each person who opens an account. What this means for you: When you open an account, we will ask for your name, address, date of birth, and other information that will allow us to identify you. We may also ask to see your driver’s license or other identifying documents.